A star with a ring of planets orbiting around it – that is the picture we know from our own solar system and from many of the thousands of exoplanets observed in recent years. 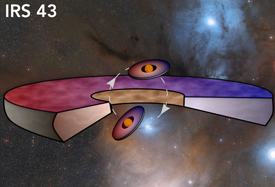 But now researchers from the Niels Bohr Institute have discovered a system consisting of two stars with three rotating planet-forming accretion discs around them. It is a binary star where each star has its own planet-forming disc and in addition, there is one large shared disc. All three planet-forming discs are misaligned in relation to one another. The spectacular results are published in the scientific journal, Astrophysical Journal Letters. A solar system is formed by a large cloud of gas and dust. The cloud of gas and dust condenses and eventually becomes so compact that it collapses into a ball of gas in the centre. Here the pressure heats up the matter and creates a glowing ball of gas, a star. 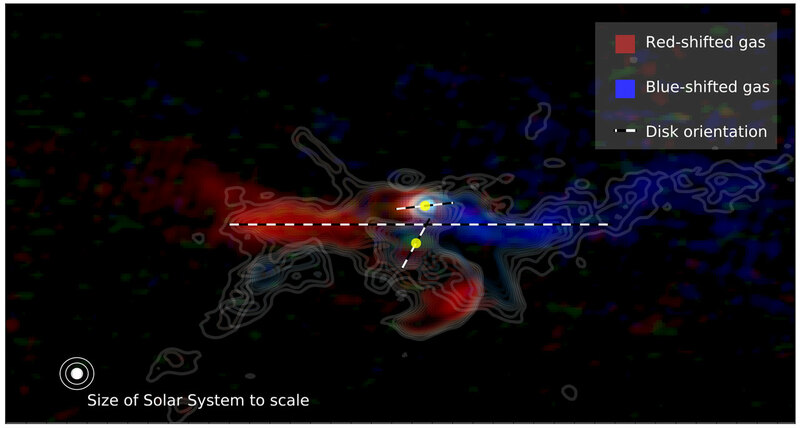 The remainder of the gas and dust cloud rotates as a disc around the newly formed star. In this rotating disc of gas and dust, the material begins to accumulate and form larger and larger clumps, which finally become planets. Often it is not just one, but two stars that are formed in the dense cloud of gas and dust. This is called a binary star and they are held together by their mutual gravity and orbit in a path around each other. About half of all stars are binary stars and they can each have a rotating disc of gas and dust. But now the researchers have observed something highly unusual: a binary star with not just two, but three rotating gas discs. “The two newly formed stars are both the size of our sun and they each have a rotating disc of gas and dust similar to the size of our solar system. In addition, they have a shared disc that is much larger and crosses over the other two discs. All three discs are staggered and this breaks with everything we have seen so far,” says Christian Brinch, assistant professor in the research group Astrophysics and Planetary Science and the Niels Bohr International Academy at the Niels Bohr Institute, University of Copenhagen. 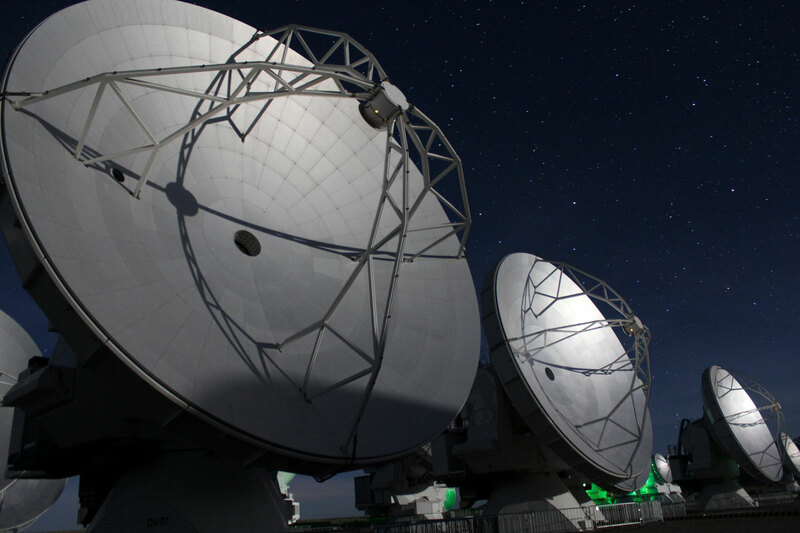 The stars were observed with the large international telescope, the Atacama Large Millimeter Array (ALMA) in northern Chile by an international team of researchers from Denmark, England and the Netherlands. The stars are about 400 light years away from the Earth. The stars are about 100-200,000 years old and planet formation may already have started. They cannot see this. But when they can see the accretion discs, it is because they are still mostly made up of gases. “What we can observe is the gas itself, because the molecules are excited by the heat from the stars and therefore emit light in the infrared and microwave range. By studying the wavelength of the light you can see whether the light source is moving farther away or is getting closer. If the light shifts towards red wavelengths it is moving farther away, while blue shift light is moving closer and thus we can see that the three planet-forming discs are almost ‘tumbling around’ and are skewed relative to each other,” explains Christian Brinch. 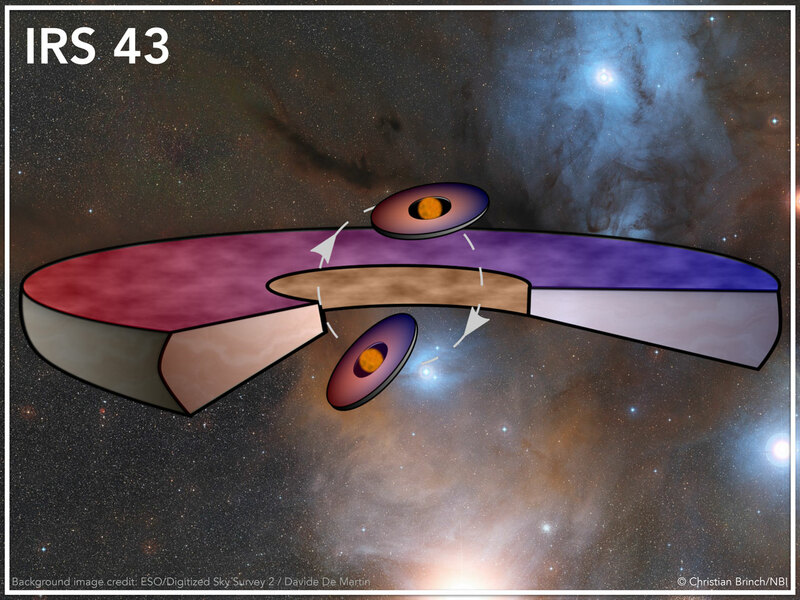 The researchers do not know why it is not a ‘nice’ system where the rotating discs of gas lie flat in relation to each other. Perhaps the formation occurred in a particularly turbulent manner. “We will use computer simulations to try to understand the physics of the formation process. Perhaps it is a dynamic process of formation, which happens often and then it corrects itself later on. We will try to clarify this. We will also apply for more observation time on the ALMA telescope to study the planet-forming discs in even higher resolution to get more detailed information about their chemical composition,” says Jes Jørgensen, associate professor in the research group Astrophysics and Planetary Science at the Niels Bohr Institute and Centre for Star and Planet Formation, University of Copenhagen.